French Model Railway: Snap Lock Connectors - a success! I suppose I'm the only person who has read all entries to this blog, and maybe just as well. For this saga of the snap lock connectors is a testament to my personality. I have changed my mind so many times over these connectors. That could be interpreted as fair-mindedness; a willingness to re-consider the evidence, a refusal to be dogmatic. Or, it could be seen as fickleness. Or, perhaps it indicates someone who doesn't know how to test out a theory, who accepts inadequate evidence and who jumps to conclusions - only to do a complete somersault the following day. 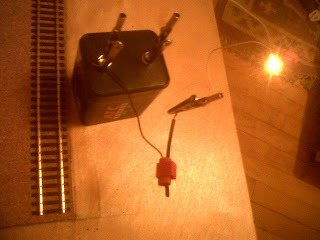 I remembered from a previous blog that if one really squeezed the connector with pliers then a successful connection could be made - so I did that. So, it's back to snap lock connectors again. a) They allow the power BUS to remain unbroken on its journey around the circuit thus providing a constant source of electrical power to all parts of the layout. b) Nigel Burkin, the doyenne of DCC model railways swears by them. I've met him a couple of times at exhibitions and spoken to him on the phone - he lives in Nairn. He really is a most patient individual and a clear thinker who explains things simply to a simpleton like me. So if it's good enough for him, I want it to be good enough for me. c) They are helluva'n easy and quick to use. d) I have had a very mixed record of success when practising with them - as reported in this blog over the last several months. Take a look at this diagram of some snap lock connectors fitted to a power BUS. 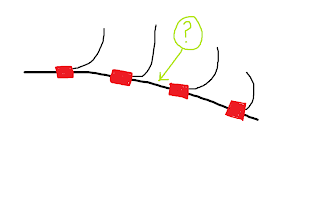 Say, one found later that it was necessary to take a feeder wire from the power BUS to where the green question mark is, then it is NOT possible to insert a snap lock connector where the arrow is pointing. 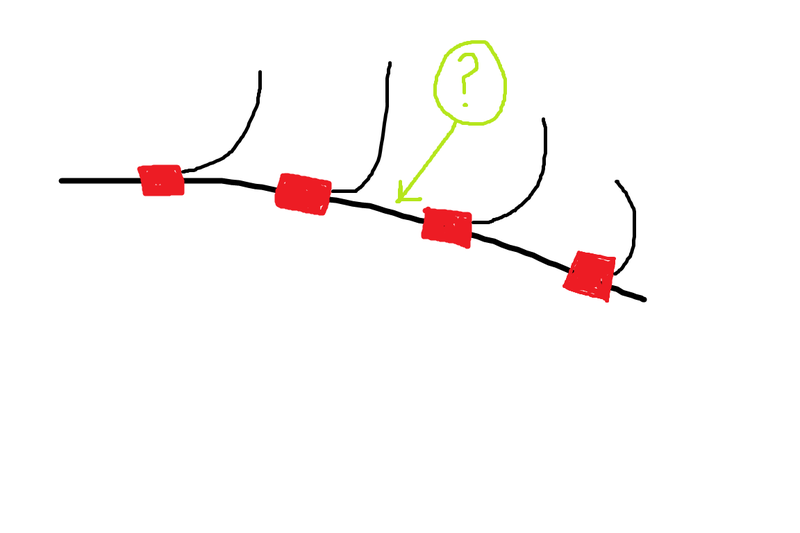 This is because the connectors are basically cylinders which can only be installed by being threaded onto the cable from either end of the cable. So once a few connectors are fitted, one cannot fit a new one in between any of them. AND, the existing ones cannot be removed without cutting the power BUS. And not cutting the power BUS cable is one of the main justifications for using these connectors. So, what I intend to do is to thread onto the power BUS more connectors than I originally seemed to need. Then I'll have spare ones to make use of if I ch- ch- ch- change my mind about where feeds to the track have to be made. 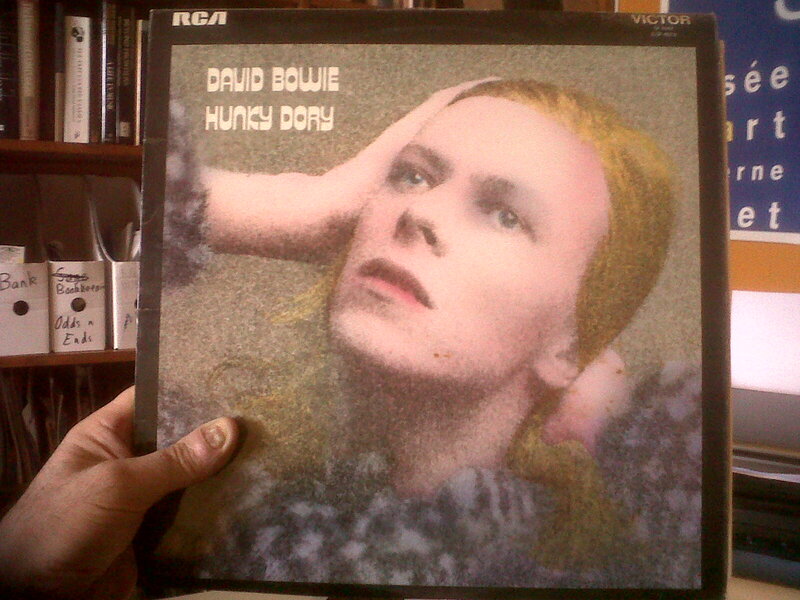 And, talking of those ch- ch- ch- changes, what a great album this was. All brilliant tracks, but for pure quirkiness of lyric, I'll go for: "Kooks" and for brooding atmosphere, "The Bewlay Brothers". But at this moment I'm listening to another of those brilliant Doses of Daily Dubstep from Radio 1 Extra followed by a drum 'n' bass mix by an Austrian DJ called "Mefjus". 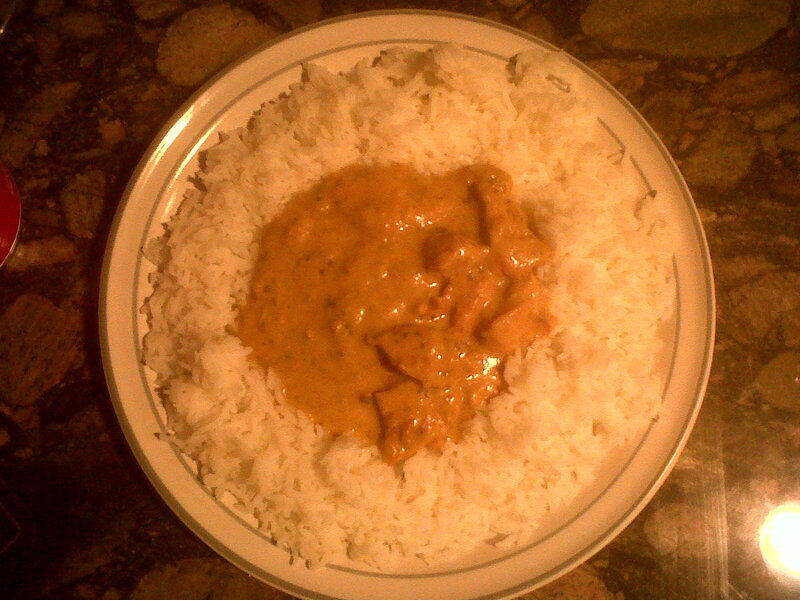 Last night's dinner was a tin of Marks and Spencer's chicken curry dumped on a bed of rice. I've enjoyed including these photographs of my meals. I wish I had compiled a similar day-by-day record thirty years ago. It would have given me an accurate reflection of my life from then to now. And a much easier one to produce than, say, writing a diary. The latter has always defeated me. Something as "everyday" as a list of one's meals provides a kind of social history. Remember those Crispy Pancakes and Vesta Chow Meins? Well, I was the kind of person who at a certain stage in my life ate those things. So, if any genuine model railway enthusiast who has opened up this blog in the hope of finding some useful advice will indulge me, I'll keep going with this feature for my own benefit.